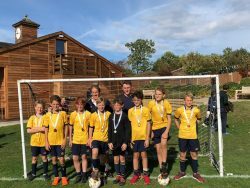 Cranleigh Prep entered the IAPS 6-a-side qualifier, held at Danes Hill School, at the end of a successful, unbeaten season. Unfortunately, we could only take a squad of eight players and as such, a number of regular 1st team boys missed out on what was a really well organised, thoroughly enjoyable event. Cranleigh Prep were drawn in Pool B – an incredibly difficult group including the hosts, Aldro and Solefield. Up against Aldro first, the boys played extremely well and won the game with a well worked team goal, finished off by Milo R.
In the second match, against the heavily fancied Danes Hill team, the game ended 0-0, but both teams had chances to win, thwarted by some outstanding goalkeeping performances. The final game against Solefield School was a tired affair and the Cranleigh Prep boys were unable to break down a resolute defence. However, this did mean that they progressed to the cup semi-finals without conceding a goal, where we faced the eventual cup winners, Downsend School. In the format of five minute halves, it is very difficult to concede first and then go on to win the match and the Cranleigh Prep team knew the first goal would be pivotal. Will S was unlucky that his one-on-one with the goalkeeper found his opponent’s legs and even more unluckily, the ball was immediately cleared up to the other end and a mistake in our defence allowed their star player a relatively simple finish. The Cranleigh Prep team regrouped very well and fought to find the equaliser, but to no avail and missed out on playing against Danes Hill in the final. There was a 3rd/4th playoff match to keep the boys engaged and this was to be the most exciting game of the tournament. Bede’s School had an extremely strong team who were unlucky to lose in their semi-final and took the game to Cranleigh Prep from the start. James D was excellent in goal and once again the boys were guilty of missing some gilt-edged opportunities. With a couple of minutes to go, Bede’s were awarded a very justified penalty when their striker was brought down unceremoniously in the box and it was duly dispatched. When most teams would have felt sorry for themselves, it was very impressive that our boys took the ball straight from the kick-off and after some slick passing, Milo R rounded the move off with a cool finish. The final whistle went immediately and the game went to extra time. After a nervy, goalless period of extra time, the game went to penalties. Once the Bede’s first penalty taker had hit the post, the Cranleigh Prep boys knew that if they scored their three penalties, it would be enough to take the bronze medals. Milo, Will and James all stepped up with confidence and scored excellent penalties to win the match and cap a fantastic morning of football. Chris Stone, Head of Football, says ‘What a fantastic end to an unbeaten season. Many congratulations to the whole team: James D, Eddie R, Bill W, Dominic H, Will S, Sam M, Milo R and Toby R. They will now proceed to the IAPS National Finals, which will be held at King’s College School, Taunton, on Sunday 4th November’.